Katie was gifted a HUGE stack of books by her aunt and uncle over the weekend. 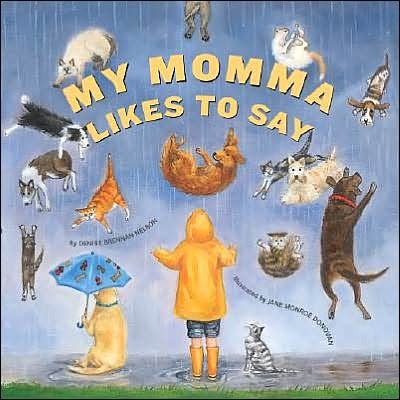 Amongst them was “My Momma Likes to Say,” written by Denise Brennan-Nelson and illustrated by Jane Monroe Donovan. Packed with idioms, proverbs, maxims, and clichés, including “you’re the apple of my eye,” “money doesn’t grow on trees,” “it’s raining cats and dogs,” and my personal favorite, “I have eyes in the back of my head,” this book is great fun for both the reader and the listener. I love the way the author marries literal and figurative meaning. A quick search shows that “My Momma Likes to Say” can be found at Barnes & Noble and Amazon. incredible post and a all round enjoyable blog (I also love the theme/design), I don’t have time to read it all at the minute but I have book-marked it and also included your RSS feeds, so when I have time I will be back to read a lot more, Please do keep up the awesome job.